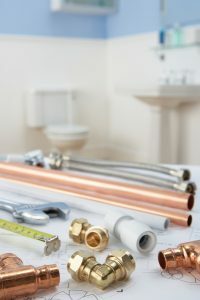 When you want to improve your home, and perhaps save a little money on your monthly bills in the process, there are a lot of plumbing installation options available to you in Essex, VT. It can be difficult to decide whether you need to replace some components of your plumbing system, but in this guide we’ll show you why you may be more satisfied with low-flow toilets, a tankless water heater, or new sink installation. Your current toilet may be responsible for a large portion of your water bills. Toilet use accounts for about 40% of your indoor water use, but, according to the U.S. Environmental Protection Agency, switching to a low-flush fixture may save you over 30% on your water bill. This is because low-flush toilets use greater pressure to flush as effectively as other toilets that rely on high volumes of water per flush. If your existing water heater is nearing the end of its life, or if you’re looking for a unit for your new home, consider an efficient tankless water heater. Tankless systems are more efficient than other systems because there is no standby energy loss. While a storage tank water heater keeps water heated all day, a tankless unit heats water directly as it flows past the heating element and to your faucets whenever a hot water tap is turned on. Tankless heaters have a longer lifespan than storage tanks and may require fewer maintenance and repair visits. If your current sink doesn’t meet all of your needs, a plumbing company can install a new sink for aesthetic purposes or to create more space for storage and cleaning. For example, if you want your sink installed at a higher level to allow for more cabinet space in the bathroom, or if you want a sink with two bowls instead of one in your kitchen, a plumber can take care of installation for you. Interested in making a few improvements to your home? Call the experts at Red Rock Mechanical for new plumbing installation in Essex, VT. The water line is one of the most vital parts of your home’s plumbing, if not the most vital: it brings fresh water from the municipal system into your pipes, pressurized so it comes out of faucets, showerheads, etc. with just a turn of the tap. If the water line suffers from damage and bursts, likely because of wear due to age, you will need to have a new line installed fast. There are a number of ways to tell that the time has come for a new water line, aside from simply having the water in your house just stop. (This might be an issue with the water department.) Here are some signs to look for that indicate the time has come for a new water line to your home. 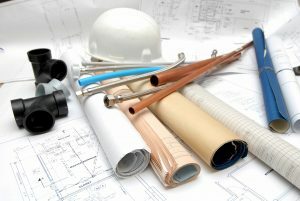 Call Red Rock Mechanical whenever you need plumbing installation in Montpelier, VT. We have emergency service available for repairs to your plumbing that can’t wait. Water flooding onto the yard or through the sidewalk: A serious water line breech will cause the water to gush up through your lawn or yard, or sometimes geyser up through cracks in the sidewalk. Although it’s possible that a municipal line may be causing the problem, don’t assume that: call for plumbers right away to look into it. If it is you water line, it will likely need a full replacement because of the breech. Drop in water pressure: When a water line starts to decay from age and corrosion (this is a problem for older galvanized steel pipes from pre-1970) leaks will begin to occur, and this will lead to a drop in the water pressure throughout your plumbing. When this begins to occur, first check with the utility company to make sure it isn’t a municipal issue. Then call for the professional plumbers to see to the trouble with the water line and advise on whether it should be replaced or not. Discolored water: Corrosion is the main enemy of water lines, and when it happens the pipe will need to be replaced. One way you can detect corrosion is from a discoloration in the water from your traps. If this appears in taps throughout your house, the culprit may be the water line. Breaks in the water line that allow in dirt and soil can also lead to discoloration in the water. Water line replacement isn’t a task you can delay: you risk losing all of your fresh water because of an aging, leaking, or broken line. Call Red Rock Mechanical at the first indication of trouble, and we will handle the plumbing installation in Montpelier, VT that you need.